The Celtic Samhain (meaning summers end) is also called All Hallows, All Hallows Eve, Hallows Een, and Halloween . It is the Witches New Year, and the most magickal night of the year. It is a spirit night when the veil between the worlds of the living and the dead is at its thinnest, opposite Beltane in the Wheel of the Year. Where Beltane is a celebration of burgeoning life, fertility and light, Samhain is the darker opposite honoring the apparent death of the earth, withdrawal into the underworld and the coming darkness of winter. Samhain is pronounced sow-in (Irish) sow-een (Welch), sav-en (Scotland) or sam-hain in the US. Samhain begins at sundown Oct. 31 and ends at sundown Nov.1 The Celts recognized only two seasons, winter and summer. Summer ran from Beltane to Samhain and winter ran from Samhain to Beltane. Modern witches mark Samhain as the end of autumn and the beginning of winter. Samhain is the end of the old year and the beginning of the New Year which begins when the sun goes down. We stand at the threshold what is past and what lies ahead. A magickal in-between time when we remember and honor the dead and try to pierce the mists of the future . If we look at time with a cyclical view rather than linear, then Samhain represents a point of time that falls outside of time. Past and future, then and now, dead and living are all mixed together at once. It is the pinnacle of “time that’s not a time and place that’s not a place”. Because of this mixing up of time and space, Samhain is the most powerful Sabbat for all types of divination. Bring out your tarot, scrying mirrors, ogham and crystal balls, for this night may reveal your future. Samhain night is the one night when the dead may easily re-enter the world of the living and visit with their loved ones. Candles light their way and we place extra food at our tables that they may be welcome when they visit. We honor them with apples and prayers, visit their graves with incense and offerings, and spend time remembering them. It is a time of the ancestors; those who are related to us by blood, and those who we feel an affinity for because of their convictions, courage, power or faith. We honor the wise women of the ages who suffered and died because their herbal knowledge, midwifery skills and healing powers were thought to be evidence of satanic influences. They were called witches and hags, crones and harpies, their knowledge disdained, disregarded and ultimately lost. 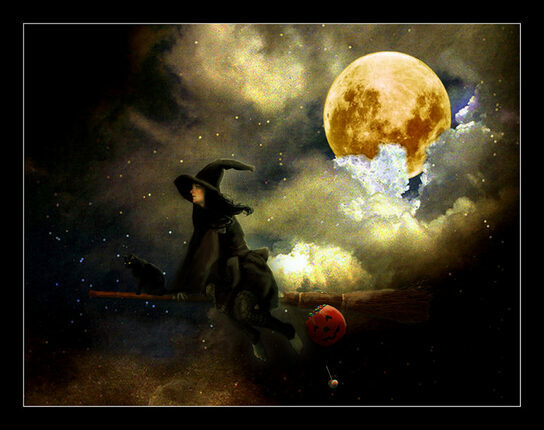 We honor them by proudly calling ourselves Witches, and at Samhain we wear the traditional witch’s hat. The image of the hat may have originated during Victorian times or around the turn of the century, in illustrations of children’s fairy tales. The tall, black, conical hat and the ugly crone became readily identifiable symbols of wickedness, to be feared by children. Before Victorian times pointed hats without brims were supposedly worn by male wizards and magicians. All pointed hats were frowned upon by the church because they were associated with the horns of the devil. To modern witches, the hat can be seen as a symbol of a witch’s magickal power. The brim may be seen as the Magick Circle, and the pointed crown may be seen as the Cone of Power that is raised during our magickal workings. So put on your hats, don your cloaks, find some stripey socks and on Samhain night stir the cauldron and conjure the magick!